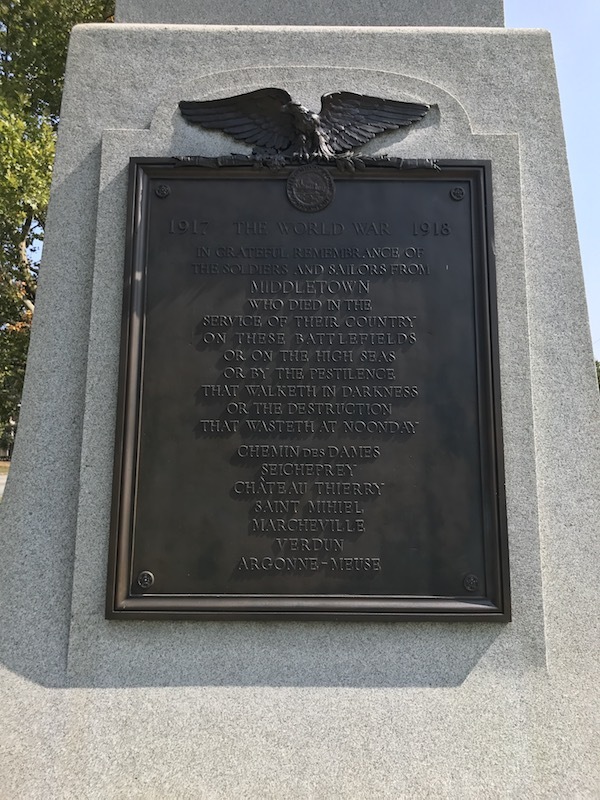 Megan Grabowski, journalism student at Southern Connecticut State University, reported this story in 2017 as part of Journalism Capstone coursework on World War I.
Middletown residents, veterans and the city partnered to finance a 50-foot marble obelisk tower to honor its World War I war dead in 1927. The granite obelisk, which towers over the Green between Park Place and Washington Street, consists of four stones, the center one weighing 45 tons and measuring 38 feet, 6 inches high. The base is 10.5 square feet, according to the Middletown Press. The granite came from Vermont. The park at one point also included memorial trees to Middletown’s war dead, and now includes other monuments dedicated to the Korean War, the Vietnam War, World War II and the Civil War veterans. Debby Shapiro, Middlesex County Historical Society member, said the Green had trees planted in devotion to each fallen man in the wars. Each tree had a plaque stating the veteran’s name and age, she said. “Trees have been replanted since the old ones were removed along with the plaques. Sadly we don’t know where the plaques are now,” Shapiro said. 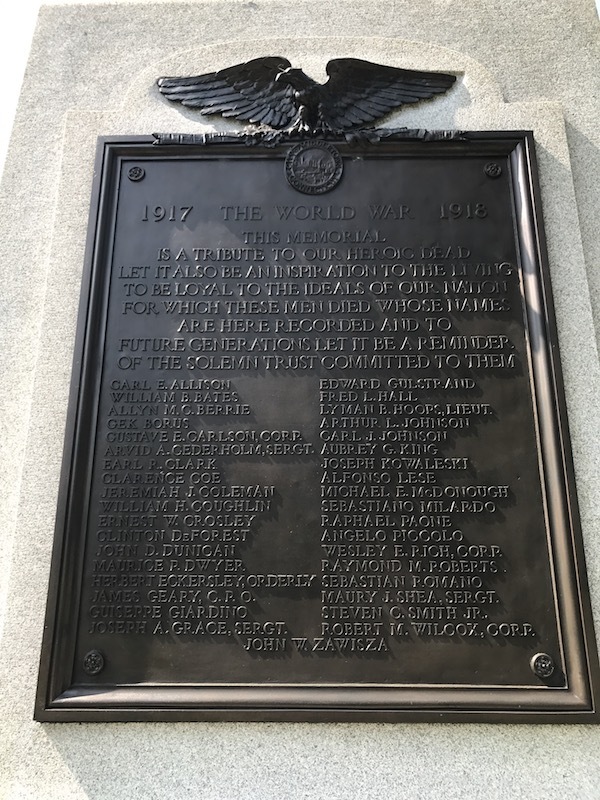 The Word War I memorial was expected to cost $20,000, according to a 1927 article in The Middletown Press. The monument was completed on Oct. 26, 1927, and was dedicated on Armistice Day, now known as Veterans Day, that same year. A committee of citizens and service organizations decided on the 50-foot obelisk because of its “aesthetic value and plain but substantial design,” according to The Middletown Press. The chairman was then-Mayor Fredrick J. Bielefield. “The first contribution toward the memorial was made by ex-Gov. Frank B. Weeks who heartily endorsed the project,” according to the article. One plaque includes a general dedication, while the second plaque lists those who died during the war.